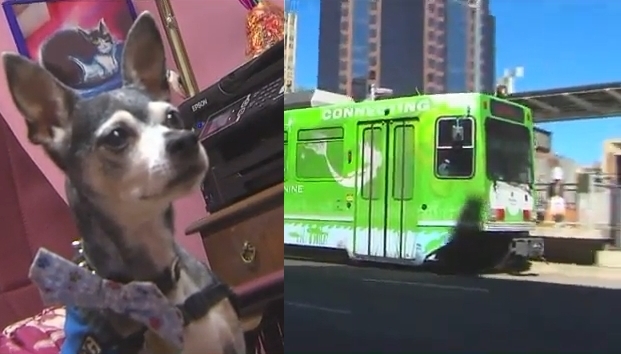 This heroic little dog from Sacramento, California saved the life of his human recently, by pulling her off of some train tracks at the last second. Both survived the harrowing event, and Hook is being lauded as a local hero! Joyce is hearing impaired, and Hook is her licensed service dog. Joyce has problems hearing environmental sounds, especially when outdoors. “When there are competing noises, I have like a 50-50 hearing loss,” said Joyce. This is in part what caused the little guy to make a heroic move. Hook and Joyce were crossing a busy intersection, and Joyce didn’t hear the RT train coming up behind her. With all the traffic and her hearing issues, things were about to get dangerous, fast. The train ended up missing Joyce by only issues. Her husband Dan is still in shock from the incident, however he is so glad that Hook was around to help. Hook is now recognized as a local hero, and his efforts have landed him a spot in the upcoming Hero Dogs Awards! Responses to "Heroic Little Dog Saves Human from Being Hit by Train at Last Minute"